We are so busy at your mountain home, swinging hammers, knocking out beams, digging trenches for drainage under floors…the closest I can get to being creative , is rubbing Aloe vera hot gel on sore muscles and Arnica on purple bruises. I do take my camera out frequently to record the renovation process and then at the same time quickly dash off to snap an insect or pretty flower or some raindrops. We have also got highspeed internet now at Coin Perdu and this weekend we cuckooed around the computer as if it were a new born baby with blue eyes! We also have a telephone. Not that I’m excited about that. I hat a telephone. But it does signify that slowly but surely things are progressing at Coin Perdu and we are not alone out here! 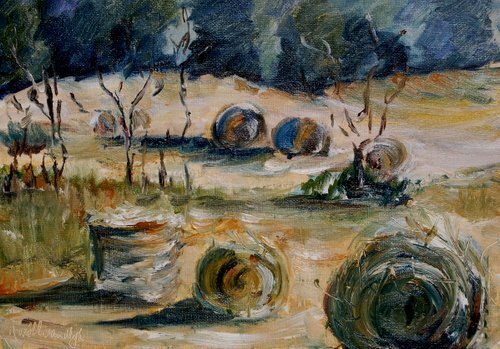 I did manage to paint the bales of hay that had been cut on our land…an interesting process that fascinated me for the whole two weeks it took to cut the land, air it, roll it and then load it to store for the winter. It gave me a huge kick to know our land was giving back to nature. Sheesh Ronell, I don’t know how you have the energy to paint after all that hard work, but you made a wonderfully energetic and lively painting. 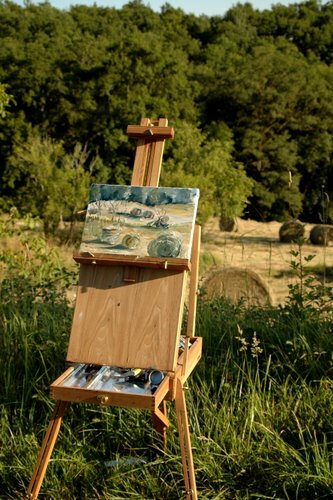 There is something so alluring about those bales (as van Gogh thought too) – we drove through fields of them in the Cape in January, I took photos but they don’t do them justice as your painting does! I woke this morning and you came to mind. How funny is that? And here I find a brand new post!!! Your painting lovely as usual and all your hard work sounds invigorating!!!! I smile at your mention of Arnica. I didn’t realize it’s still around. When I was little my grandmother would rub it on my bruises as well. I am happy to here you summer is both productive and creative! Wow – this painting has a lot of impact. Wonderful choice of colour and values – you’ve made the subject new all over again. So great to see you painting again, Ronell. I’ve been loving your renovation photos and your intense close-ups of nature. I can imagine your excitement to finally get a highspeed internet again. We were without any connection at all for three months here and it made me realise how difficult life would have been for expats in the past. Love your oils Ronell! It’s so cool to see your set up too. Also, your cartoons in the post above are beyond adorable!!! When we had the hay cut in our bottom paddock, I didn’t know what to expect. But once those huge hay bales turned up, I felt like somebody had left sculpture in the bottom paddock. They’re gorgeous. Next Next post: Sketching some things..